could burn down a small city. (To borrow an image from another). I want a miniature (and reworked – would have to be a little less intricate) version of this sketch I did a while ago, tattoo’d on me. Very soon. 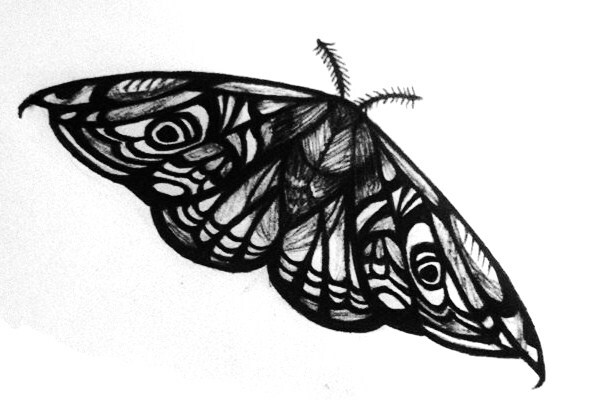 (‘La Mariposa de la Muerte’ is the Spanish name for the Black Witch Moth – the one from Silence of the Lambs. While I like the idea of a butterfly of death, I’m not sure I want one on me. Besides, this one’s prettier). Now to decide where to have it, and who to ask to do it. This entry was posted on Saturday, May 5th, 2012 at 2:40 pm	and tagged with anger, black witch moth, death, feelings, life, moth, musings, pain, people, personal, pictures, projects, rage, random, relationships, smiles, tattoo, thoughts, today, women and posted in Projects. You can follow any responses to this entry through the RSS 2.0 feed. Moths are amazing, we have many here inthe northwest, they love the rain forests. It’ll make a pretty tattoo.